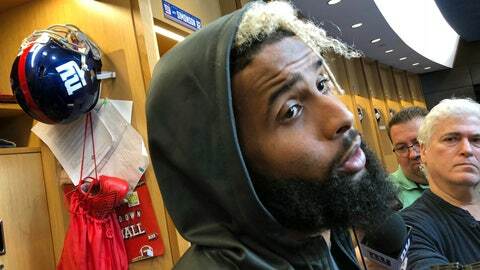 EAST RUTHERFORD, N.J. (AP) — Failing to catch a touchdown in the first four games of the season hasn’t frustrated Odell Beckham Jr. of the New York Giants. The NFL’s highest-paid receiver laughs when any form of the word frustration is used to ask about not getting into the end zone. His response is don’t worry. The TDs will come. It’s just a matter of time. The problem for the Giants (1-3) is they need something to happen soon. This weekend on the road against the Carolina Panthers (2-1) would be timely. Beckham, who signed a five-year, $95 million contract extension in training camp, is having a good season coming off a broken ankle that limited him to four games last season. He leads the team with 31 catches for 331 yards, a 10.7 yard average. The only thing absent from his statistics is the touchdowns, and there is a good reason for that. Opposing teams are doubling him more often than not, and they are playing a lot of two-deep zone to prevent him from going deep. That’s what Panthers coach Ron Rivera saw when he watched film of the Giants’ offense. The Giants also have been without tight end Evan Engram since he sprained a knee in Week 3 at Houston. He helps open things up for the other receivers. Beckham said in a recent game the Giants got into the red zone and set up for a passing play. He looked up and saw a nickel cornerback covering him with a safety offering help over the top and a linebacker shading in his direction. The Giants have struggled to score points. They have been held to 15, 13 and 18 in losses to the Jaguars, Cowboys and Saints. They beat Houston 27-22 in their best game offensive, although they were held to seven points in the second half. What’s been missing has been the big play. New York has nine passes of 20 or more yards and only two at 30 or better. Beckham’s long was a 30-yarder against Houston. The running game is similar. The Giants have nine runs of 20 or more yards, with Saquon Barkley having eight of them, the long being a 68-yarder against Jacksonville. It’s the only run over 30 yards. Offensive coordinator Mike Shula, who was the Panthers coordinator last season, said the Giants aren’t going to start forcing passes to Beckham, who had 38 touchdown catches in his first four seasons, the last being a four-game run. Beckham said the offense has just made too many mistakes. They move the chains on drives and then allow a sack or commit a penalty that puts them in second or third-and-long. It’s a no-win situation. In the three losses, the Giants have gotten into the red zone six times, scoring three touchdowns. That’s not enough for either the number of trips or the TDs. Beckham believes he will step up. NOTES: CB Eli Apple (hamstring) practiced fully for the first time since being hurt against Dallas on Sept. 16. … LB Olivier Vernon (ankle) was limited. He has not played in a game this season. … New York signed WR Quadree Henderson to the practice squad. He is a rookie out of Pittsburgh.